Nicholas Swims through the Pain Barrier. With the Irish and British Youth Championships approaching, Nicholas Quinn's training and preparations were coming together nicely. He was in superb form and really looking forward to the upcoming Championships. Then two weeks before the Irish Championships he suffered a frightening fall whilst cycling into training. Miraculously nothing was broken but the injuries to his shoulder and wrist were more than enough to jeopardise his participation in the upcoming events. The easy option I suppose would have been to count himself lucky, forget the Championships and look towards next year. However the top athletes don't think like that. He decided to give himself a chance. He returned to the pool almost immediately. The first few times were extremely painful, but with the support of his family, Coach Marian English and his own incredible determination he found himself heading to the National Aquatic Centre for the last day of competition against all the odds. Swimming in two events the 200 meter individual medley and the 200 meter breaststroke Nicholas although someway off his own personal best times still managed to make the final of both events finishing 5th in the breaststroke and taking the silver medal in the individual medley. Then on the 3rd of August he travelled to Sheffield to take part in the UKs premier youth meet as part of a 35 strong Irish team. In the 200 breaststroke a personal best time of 2.24.16 saw Nicholas narrowly miss the final. In the 100 breaststroke having secured a place in the final he achieved yet another personal best time finishing 8th overall. An amazing performance, considering his condition a few weeks previously. Well done to Nicholas who continues to be an example to all the aspiring young swimmers in the Castlebar Swimming Club. 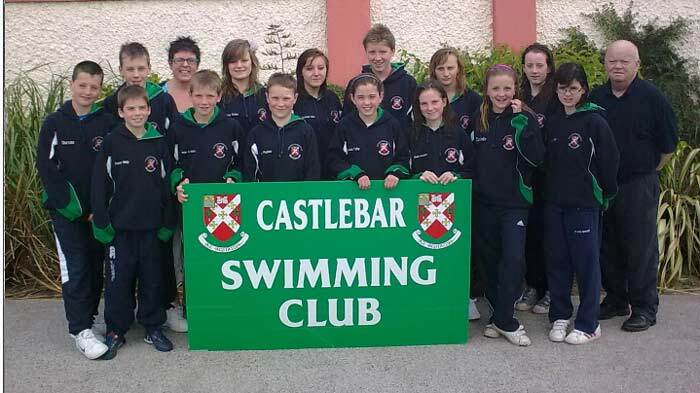 Castlebar Swimmers Shine At Connacht Championships. The Annual Connacht Championships were held recently in Leisureland Galway over two days and Castlebar Swimming Club was well represented with a number of swimmers recording some excellent performances. In the Boys 15 and over age group Nicholas Quinn secured three gold medals in the 50m butterfly, 200m butterfly and 200m freestyle events as well as making the final of the 50m backcrawl. James Sweeney took the gold in fantastic style in the 50m breaststroke and was a finalist in the 50m freestyle. Padraic Rocliffe had a brilliant swim in the final of the 50m freestyle taking the silver in a time of 26.00 seconds. It was a case of déjà vu in the final of the 50m backcrawl with Padraic again missing out on the gold by the narrowest of margins. James Caulfield, Killian Dervan and Cathal Lavell were also competing in this age group and swam tremendously well. Killian secured the bronze medal in the 200m breaststroke ,James was a finalist in the 50m backcrawl, and Cathal achieved a personal best time in the 200m individual medley. In the girls 15 and over age group Castlebar were well represented by Deirdre McGauran, Sarah Granahan, Catriona Walsh and Aisling Conlon . All of the girls swam extremely well achieving personal best times in this highly competitive category. In the girls 14 and under age group Castlebar had a great weekend with some outstanding performances. Amber Fadden had a brilliant swim in the 200m breaststroke to take the silver medal. Sinead Mylette continues to impress and took the bronze medal in the 200m butterfly. Louise Dervan had a terrific swim in the keenly contested 50m breaststroke final missing out on a medal by split seconds. Also competing in this age group were Chloe Sheridan, Aisling Grady, Ellen Murphy and Carla Padden who all had some excellent results including a Division 1 qualification time for Ellen Murphy. Finally, in the boys 14 and under age group, Eoghan Grady and Cillian Melly both secured silver medals in the 400m individual medley and 200m butterfly respectively. Eoghan also made the final of the 50m breaststroke. Competing along with them in this age group were Patrick Livingstone, Condlae McGurrin, Brian O'Malley and Ryan Padden who all performed well in their individual events. Well done to all those who competed over the two days. The University Arena, Limerick was the venue for the recent Irish age groups Division 2 competition held over 3 days at the end of June 2010. Castlebar Swimming Club sent a squad of 14 swimmers to compete and they did their club proud with some fantastic results. Louise Dervan was in superb form securing three golds in the 200 meter individual medley, 400 meter freestyle and the 100 meter breaststroke. She also added two silvers and a bronze medal to her tally in the 200 meter breaststroke 400 meter individual medley and 200 meter freestyle. Louise was also presented with a trophy for coming 2nd overall in the girls 13/14 age group. Caoimhe Hennigan took the bronze in the 800 meter freestyle in a personal best time and competed in the relays for Castlebar with Laura Fahy, Niamh Hennigan, and Aoibheann Hennigan. Catriona Walsh and Aisling Conlon were both in excellent form making several finals and just missing a podium finish. Carla Padden also had a number of fine swims including some personal best times. In the boys section Brian O`Malley had a tremendous competition resulting in three gold medals in the 200 meter butterfly, the 400 meter individual medley, and the 100 meter butterfly. Brian also claimed three silver medals in the 200 meter individual medley, the 100 meter backstroke,100 meter freestyle and a bronze in the 200 meter backstroke. Cathal Lavelle was in excellent form and secured two golds in the 200 meter freestyle and the 100 meter butterfly.Cathal also claimed the silver in the 200 meter butterfly. Condlae McGurrin had a brilliant swim to claim bronze in the 400 meter individual medley and achieved a division 1 qualification time in the 200 meter freestyle. Mark Dervan claimed the silver medal with an excellent swim in the 200 meter butterfly, and was on the relay team alongside Ryan Padden, Brian O`Malley and Connor Melly who claimed silver in the 200 meter freestyle relay and bronze in the 200 meter medley relay. Overall a fantastic effort from all the swimmers who represented their club so well, and a rich reward for all their hard work and long hours of training throughout the year. Many thanks to their Coach Joe Moran and all the parents who helped with the squad and the officials throughout the competition.